A team of researchers at the Instituto de Astrofísica de Canarias (IAC) and at the National Astronomical Observatories of Beijing (NAOC) have published a paper which suggests that if we could travel at the speed of light it would take us 200,000 years to cross the disc of our galaxy. Spiral galaxies such as the Milky Way have discs which are really thin, in which the major fraction of their stars are found. These discs are limited in size, so that beyond certain radius there are very few stars left. In our galaxy we were not aware that there are stars in the disc at distances from the centre more than twice that of the Sun. This means that our own star was apparently orbiting at about half the galactic radius. However now we know that there are stars quite a bit further out, at more than three times this distance, and it is probable that some stars are at more than four times the distance of the Sun from the galactic centre. 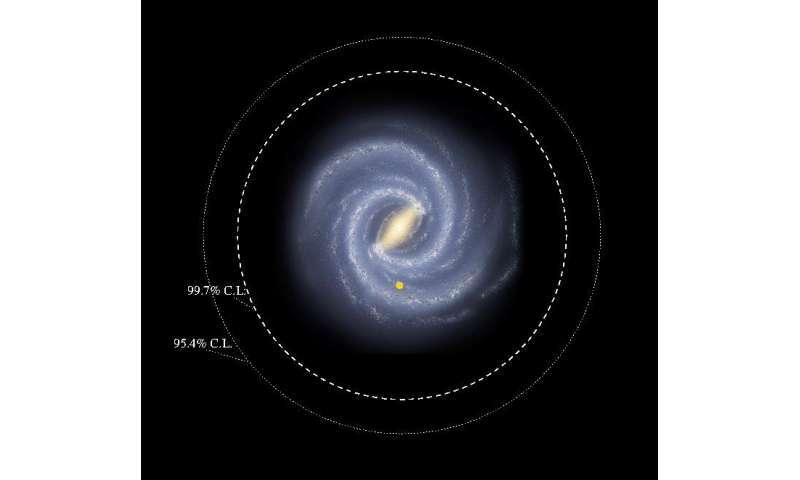 "The disc of our galaxy is huge, around 200 thousand light-years in diameter," says Martín López-Corredoira, a researcher at the IAC and the first author of the article recently published in the journal Astronomy & Astrophysics, and whose authors come from both the IAC and the NAOC. In broad terms, we can think of galaxies like the Milky Way as being composed of a rotating disc, which includes spiral arms, and a halo, spherical in shape, which surrounds it. This piece of research has compared the abundances of metals (heavy elements) in the stars of the galactic plane with those of the halo, to find that there is a mixture of disc and halo stars out to the large distances indicated. The researchers came to these conclusions after make a statistical analysis of survey date from APOGEE and LAMOST, two projects which obtain spectra of stars to extract information about their velocities and their chemical compositions. "Using the metallicities of the stars in the catalogues from the high quality spectral atlases of APOGEE and LAMOST, and with the distances at which the objects are situated, we have shown that there is an appreciable fraction of stars with higher metallicity, characteristic of disc stars, further out than the previously assumed limit on the radius of the galaxy disc" explains Carlos Allende, a researcher at the IAC and a co-author of this publication. Francisco Garzón, an IAC researcher who is another of the authors of the article explains, "We have not used models, which sometimes give us only the answers for which they were designed, but we have employed only the statistics of a large number of objects. The results are therefore free from a priori assumptions, apart from a few basic and well established ones." if we could travel at the speed of light it would take us 200,000 years to cross the disc of our galaxy. Yep, if we could go light-speed, then we could go ANYWHERE, instantly. But when you got there what you'd see would be 200,000 years in the future. What, in the depiction of the Milky Way, do the initials C.L. stand for? Twice the diameter: is it double the stars twice as massive or just 200thousand light year same number of stars.